Santa is back at Brockholes. 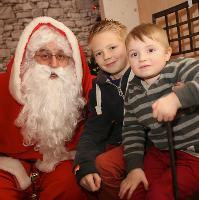 Come and meet him in our magical Christmas Grotto! Each child will receive a present from Santa and there will be an opportunity for you to take photographs. Santa is always popular, so we advise you to prebook your appointment early! Appointments are available between 11.30am and 3.00pm, in 30 minute time slots, so if you book the 11.30am - 12.00 noon time slot you will see Santa sometime in that 30 minutes. All children require a ticket to see Santa regardless of age. Book an under 3's ticket if required to ensure that children receive an age appropriate present. All children must be accompanied by an adult. There is no charge for accompanying adults. The Grotto will be located on our floating Visitor Village and sign posted for you, just head there in time for your appointment slot.